This weekend will be somewhat like "The Days of Bees and Roses." On Saturday and Sunday, May 2-3, the California Center for Urban Horticulture (CCHU) and the Foundation Plant Services, two entities within the UC Davis College of Agricultural and Environmental Sciences, will sponsor their annual Rose Days at 655 Hopkins Road, Davis, west of the central UC Davis campus. The event, open from 10 a.m. to 3 p.m., is free and open to the public. The May 2-3 event includes tours, information booths and a rose sale. Saturday's speakers are three of the most talented Rosarians in the Sacramento area, according to CCHU program manager Anne Schellman. Linda Knowles and Charlotte Owendyk are Consulting Rosarians and will present Easy Care Roses in the Landscape at 10 a.m. Baldo Villegas, a Master Consulting Rosarian, will present Baldo's Rose-Growing Secrets at 11 a.m. Their talks will be in the Trinchero Building, a newly built facility located next to the Foundation Plant Services. Bus tours held from 12:30-3 p.m. on both Saturday and Sunday will showcase the Foundation Plant Services' eight acres of roses. In addition, UC Master Gardeners and rosarians will be present both days to answer questions. Many of the roses offered for sale will beckon you with their enticing names. You'll see the Carefree Spirit (red), New Dawn (pink) and Limoncello (yellow), among others. And you may just find a honey bee on a rose, although honey bees generally don't forage on today's modern commercial roses. When it comes to roses, bees are more likely to head for the heirlooms, especially those that have single blossoms. They seem especially attracted to the California wild rose, Rosa californica. But for sure, you'll find bees at the Häagen-Dazs Honey Bee Haven, a half-acre bee garden located on Bee Biology Road next to the Harry H. Laidlaw Jr. Honey Bee Research Facility. You'll not only see bees and other pollinators in the haven, but a bee observation hive from the Laidlaw facility on Saturday, May 2, which is the fifth anniversary of the haven. The bee garden is open daily from dawn to dusk but this is a special celebration that will take place from 10 a.m. to 2 p.m. It will begin with several speakers at a short ceremony from 10 to 11:30 a.m. Michael Parrella, professor and chair of the UC Davis Department of Entomology and Nematology, which operates the haven, will welcome the crowd at 10 and talk about the history. Raj Brahmbhatt, associate brand manager of Häagen-Dazs Ice Cream at Nestle USA, Dreyer's Ice Cream company, will speak at 10:50 a.m. on “What the Haven Means to Us.” Christine Casey, manager of the haven, will discuss “What Your Donations Mean to the Haven” at 11:15. Also during the fifth anniversary celebration at the haven, folks can learn about honey bees and native bees, take a guided tour of the garden, and buy bee condos (bee houses made for leafcutter bees and mason bees). See more about the history of the garden and the fifth anniversary celebration here. It's free and open to the public. Then the following Saturday, May 9, will be the UC Davis Bee Symposium on "Keeping Bees Healthy," from 8:30 a.m. to 6:30 p.m. in the UC Davis Conference Center. The event, presented by the Honey and Pollination Center at the Robert Mondavi Institute for Wine and Food Science, and the Department of Entomology and Nematology, will feature keynote speaker Marla Spivak, Distinguished McKnight Professor, University of Minnesota and a 2010 MacArthur Fellow. 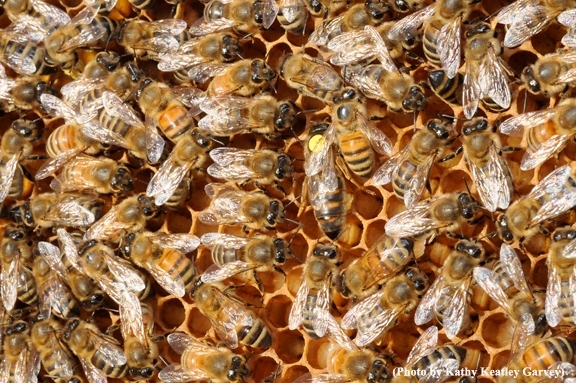 Spivak will speak on "Helping Bees Stand on Their Own Six Feet." One of the UC Davis speakers will be pollination ecologist Neal Williams, associate professor of entomology at UC Davis, who will discuss "Enhancing Forage for Bees." See more information here. 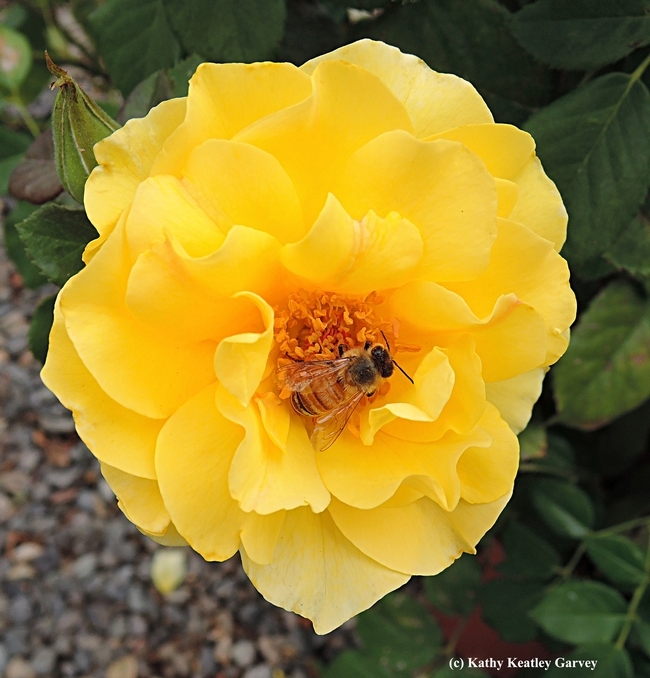 Everything's coming up roses--and bees! It doesn't get much better than that!